This is a book I was looking forward to from the moment I heard about well over a year ago. Mitch Steele the head brewer at Stone brewing has been a guest on the brewing network quite a few times, and he also happens to be a member of Brew free or Die. I’ve read the other two books published by Authors from Stone Brewing Company, so why would this be any different. 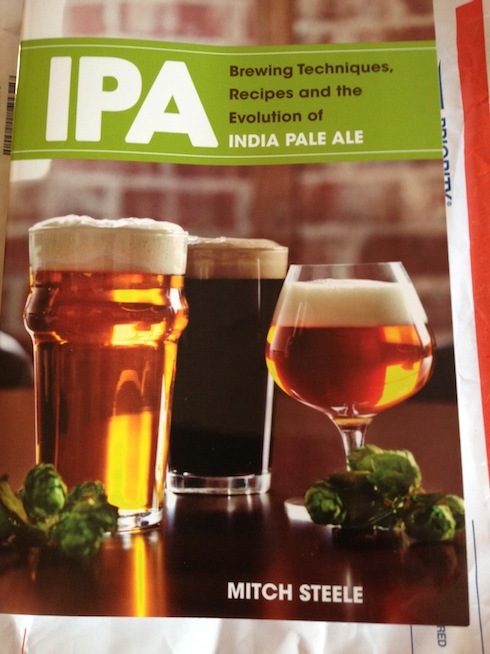 The book has two main sections, the history of IPA to a vast collection of IPA recipes. Along the way manages to correct the myth of the origin of the name, and perhaps introducing a new one, alluding to brett in the original IPAs. There are lots of historic brewing statistics, to be honest, I mostly ignored them. The book is organized in three sections, the history, Techniques and Ingredients, and last by not least recipes.Having read numerous brewing books, of both instructional, historic, and recipe this is a great combination of all three. While the historic information may be not be terribly exciting, it’s good to see the myth of IPA name corrected. It’s also great to see so many recipes for amazing IPA’s in one book. There is a large section dedicate to brewing techniques, and ingredients for IPA’s. The key to understanding how to make your own recipe, is understanding the goals and methods to achieve them. The sections on designing hop bitterness, and brewhouse techniques will be valuable in my future recipe design. I also can’t wait to try some of the amazing recipes from the likes of Russian River, DogfishHead, The Alchemist, Hill Farmstead, Avery, etc. My only disappointment is that we only got black ipa recipes from the new England greats The Alchemist and Hill Farmstead, what I wouldn’t do for a recipe for Edward or Heady Topper. Homebrewer, Cyclist, locavore, Craft Beer lover, husband, father, blogger, photographer, alpaca farmer, New England sports fan, all around Geek. Book Review: Beer is Proof God Loves US. Charles W. Bamforth Quick book review: Brewing Made Easy Book Review: Brew like a Pro by Dave Miller Review: Homebrewers Guide to Vintage Beers Fathers day gifts for the homebrewer. Poll: What else are you interested in reading here? What’s in the brew day toolbox? Poll: what do you do with your water? Poll: What’s your source of recipes / brewing kits?